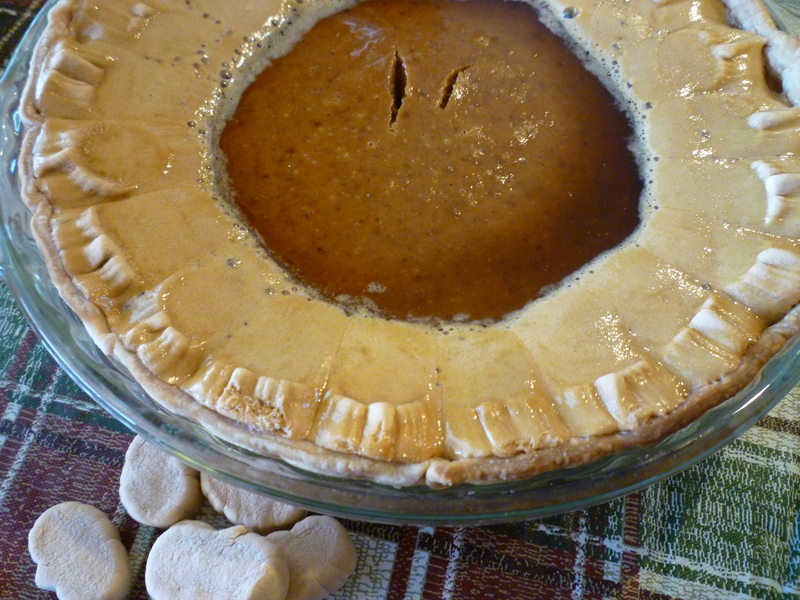 This is the pumpkin pie that I took to my in-law’s yesterday … kind of ugly and embarrassing. This is the pie that I baked to leave at home. Let me tell you what happened … I baked two pies … one was a little larger than the other. The plan was to take the larger pie and leave the smaller one at home. 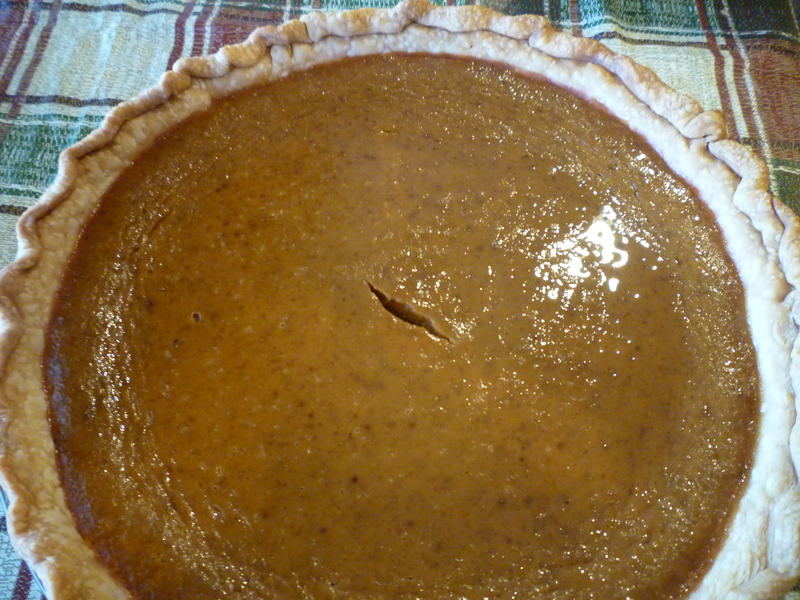 I used ready-made pie crust … it wasn’t large enough to crimp the edges of the large pie. A brilliant solution came to me … after baking, I would place some of those small pumpkin shaped marshmallows around the edge of the pie. Sounds good … doesn’t it? We had a short discussion … the hubby, son #2 and me … about food presentation. Son #2 and the hubby have the opinion that too many television chefs place too much importance on food presentation. I believe that presentation is important, but the food does not have to be a “work of art”. After all … everyone is entitled to an opinion … right? So, after I took the pies out of the oven and placed them on a cooling rack … I carefully placed the pumpkin marshmallows on the larger pie. I thought that it looked rather cute … and I wanted the marshmallows to melt a little bit and stick to the pie. I took a shower … 30 minutes later … the marshmallows did stick to the pie … and no longer looked like pumpkins! In my opinion … the pie looked like a big gooey mess (refer to photo #1). I took both pies … figuring that no one would touch the gooey one. Well, they ate the gooey one … and the smaller one did come home with me. Did it taste better than the one without the marshmallows? It actually looks really good! They tasted pretty much the same! The marshmallows just added a gooey texture. Well Brenda, I had a piece of the Marshmello Pumpkin Pie and tt tasted very good. I just posted my absolute fav Pumpkin Pie recipe that was given to me and taught to me by my great Aunt Helen. She lived to be 103 and was the best baker I know! See http://www.hoorayforbooks.com/blog for the recipe. It has more spices than usual which is why everyone loves it! No marshmallows in it! Good luck! If there were kids at the dinner, they would have loved the marshmallow pie! And kids-at-heart.